In the year 1948 Wolfgang Pauli wrote a paper called "Background Physics" which he talked also about in Carl Jung's Psychological Club [Question: How many listeners did really understand what he said?] The history of this paper I described in http://paulijungunusmundus.eu/synw/paul ... ync.htm#a1 . Here I'd like to talk a little about the content of this very important paper, which Pauli never published. It was first published in Wolfgang Pauli und C.G. Jung -- ein Briefwechsel 1932 - 1958 by C.A. Meier in 1992 (today also as Atom and Archetype in English). Last edited by Remo Roth on Thu Nov 14, 2013 7:49 am, edited 2 times in total. In October 1934 Pauli decided -- surely under the influence of his wife -- to end his psychoanalysis with Carl Jung. Then however, he began to dream very strange dreams about physical terms he first thought of to be a "misuse of physics terminology" by the "unconscious" [letter 11P]. He however saw already that these images could be "a preliminary stage of conceptual thinking." And then he comes back to his anticipation of 1934 that these symbolic images of his dreams could be "a preliminary stage of conceptual thinking." The result of the latter should be the formulation of a so-called "neutral language" which describes a new scientific worldview beyond the split of physics and depth psychology, of what we call today the psychophysical reality or unus mundus. Last edited by Remo Roth on Thu Jun 29, 2006 5:21 am, edited 1 time in total. We can therefore say that in 1948 a revolution happened, which however not too many people did really realize up until today. Implicitely Pauli states that there must be a "background" behind or perhaps even beyond physics, which we have to describe in a scientific language. To succeed in this task, we have however first to find specific terms which we have further to derive from these physical-symbolic dream images. Some years ago I began to realize that Wolfgang Pauli went further than Carl Jung with the above statements. In fact, he does not speek of depth psychology anymore, but of the "prescientific state" of a completely revolutionary new worldview. Where Carl Jung reduces the symbols in Pauli's dreams onto the concepts of his (Neoplatonic) depth psychological theory, Pauli felt that we must dig deeper. We have to go back to Hermetic alchemy -- which means in my terminology: include the unio corporalis or coniunctio archetype. This does however not mean that we regress to Medieval magics -- what happens today in all these esoteric circles -- but that we have to include the modern epistemological insights of quantum physics. The most important insight is what I call the singular (acausal) quantum leap I described in many other posts (Google with remo roth singular quantum leap to find them). Thus, we have to develop a theory of a modern worldview beyond physics as well as depth psychology. This is what my dreams tell me to be my fate, and what I'm trying for more than 33 years now. I fell ill with a bone tuberculosis in the age of 5 1/2 years. For almost 3 years I was then locked up in a cast in the "Zauberberg" (Thomas Mann), in Davos, Switzerland. Much later I read that Brahman boys, before going to school with 9 years, have to learn to meditate. This education dures 3 years, from 6 to 9. It seems that something similar happened to me -- my archetypal fate. In the "Zauberberg" (the magic mountain) I learned by myself to meditate upon my body, and especially upon my belly. It seems that I was like this unconsciously thrown back into Hermetic alchemy. Only like this I can imagine that I developed such an incredible energy to deal with all this alchemical, physical and depth psychological stuff I'm interested in now for 33 years. It seems to be my fate that I'm dealing with what Wolfgang Pauli began -- the New Hermetic science of the 21st century. Why am I writing about all this personal stuff? I am not the man who likes to talk too much of himself. However, I have seen during the last years that a new science must have in mind what Carl Jung called the "personal equation." He introduced it as a means in depth psychology with the help of which everyone can realize that every theory is onesided. For example Carl Jung's depth psychology is insofar onesided as it is created by what he called an intuitive thinking type. Such a scientist is on the one hand very speculative, and on the other he represses (first) his feeling and sensation function. My typology is intuition/feeling. We can imagine that such a type develops, if at all, a different theory than Jung's. The natural development of such a type is however to become an artist. This is what I did when I learned autodidacticaly sculpturing and playing some music instruments. 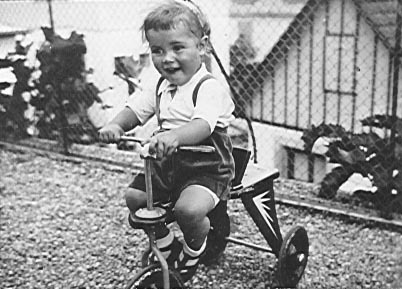 However, because of my severe disease and a resulting handicap (since then I'm limping) in the early childhood, I was not able to become an artist. Since I am handicapped, I had to develop my thinking and thus to study something. I did not exactly know what, thus I decided to do general studies (like the universal scholars of the middle ages). Only much later I realized that also Wolfgang Pauli had such a background (of course much broader than mine). This "distortion" is why as an intuition/feeling type I am able to write in a scientific language. Further, my mathematical studies helped me to learn to think more or less consistently. However, I can only think what I am interested in. This is a typical handicap of a feeling type. I was very astonished when I realized during my studies at the univsersities that there are people who can also think about things they detest completely. I could never, since my feeling function rebels immediately. Thus, one very important aspect of my specific individuation process was and still is to bring together all the four functions Carl Jung described in his early book Psychological Types. This is a specific trouble of people who suffer a so-called "distortion neurosis" (Carl Jung). But if they realize their distortion, they can “switch back” into their main function, have however already well developed the other functions. For typological remarks above see Marie-Louise von Franz: On Jung’s Typology – The Inferior Function. Last edited by Remo Roth on Mon Jun 26, 2006 10:40 pm, edited 1 time in total. As Pauli writes in a letter to Jung, he lived first the thinking as his main function. Thus his feelings were extremely repressed. This is however not alone his trouble, but the problem of most scientists. The development of today's science (and medicine) was only possible because of this repression. Remember for example how many animals are tortured and killed in animal experiments. Pauli continues then in telling Jung that he changed his typology. When he got older his main function became more and more the intuition. I'm sure that only because of such a specific development he was able to abolish his distortion. Further, only like this he became also able to enter what Carl Jung called the symbolic thinking (which is in fact an intuitive thinking; see Symbols of Transformation, Part I, Chapter II. Thus, modern scientists should realize that they repress their feeling function. They should integrate their mostly inferior feeling, and further accept the symbolic thinking. Only like this -- in general by the realization of the personal typology (the "personal equation") and the acceptance of the inferior function (mostly feeling) -- a modern scientist can go on and grow into what I call the Hermetic science of the 21st century. Last edited by Remo Roth on Wed Jun 28, 2006 4:49 pm, edited 1 time in total. With the help of Carl Jung's typology we can also understand what happened during the first scientific revolution in the 17th century. Up until then the philosophers of nature (as one calls these "prescientific scientists") looked at nature with the help of their feeling and intuition function, and thinking was based on these two. In the language of today's science we would say that they phantasized. They did not see the concrete world as we percept it today with the help of our five senses. A good example for such a worldview is Robert Fludd, the physician, alchemist and Rosicrucian. His counterpart was Johannes Kepler who began to introduce mathematics into science and like this found the motion laws of the planets. He found them with the help of the observations of Tycho Brahe. The latter noted thousands of positions of the planets, and Kepler had the idea to describe these motions in a general way with the help of math. Thus, we see here the great leap that happened then. Math and like this abstract thinking entered science. Since according to Carl Jung thinking and feeling are opposites, the feeling function was more and more repressed in science. The thinking replaced the feeling, and because of the repression of the feeling function a new type of consciousness developed. It was based on thinking, (extraverted) sensation and intuition. I call it the Logos ego. Robert Fludd, however, was and stayed in what I call today the Eros ego, based on the feeling, the (introverted) sensation and intuition functions. Wolfgang Pauli was very much interested in the opposition between Kepler and Flud, and dealt very much with it. 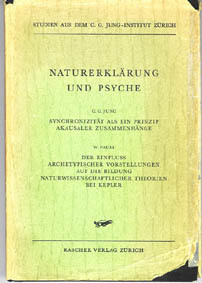 He wrote the essay Der Einfluss archetypischer Vorstellungen auf die Bildung naturwissenschaftlicher Theorien bei Kepler (The Influence of Archetypal Ideas on the Scientific Theories of Kepler) Together with Carl Jung's synchronicity article he published it in 1952 in the book Naturerklärung und Psyche. "that I carry ‘Kepler’ as well as ‘Fludd’ in myself and that it is for me a necessity to arrive at a synthesis of this pair of opposites, as best I can" [Enz, 2002]. Therefore we can conclude, that Pauli tried to find the above mentioned synthesis of Kepler and Fludd in himself in this article. As we will see, he did however not succeed in this task. Last edited by Remo Roth on Fri Aug 06, 2010 8:32 am, edited 2 times in total. The controversy between Kepler and Fludd is connected, from the point of view of the history of ideas, with the existence in the Middle Ages of two different philosophical trends which I may designate briefly as the Platonic and the alchemistic or hermetic. In his letters Pauli shows even much more that this difference is the one between Neoplatonic alchemy and Hermetic alchemy ( Details see in http://www.psychovision.ch/synw/platinf ... p1.htm#411 ). For the Platonist, the life of the Deity which he conceives in a more or less pantheistic spirit, that is to say as identical with the totality of the world, consists of a cosmic cycle which begins with the emanation from the Godhead first of the 'ideas' and 'souls,' then of the corporeal world, and ends with the return of all things to God. The idea of the opus and its result, and thus the idea of transmutation (Wandlung), is foreign to the Platonist. The final stage of the cycle is identical with the initial stage, and this process continues for ever and ever. As we realize, this Platonic idea is also the (unconscious) background of modern science. The energy conservation law of physics is the best expression of this idea of a static Godhead, which is of course a Christian prejudice. Remember that Pauli invented the neutrino/antineutrino exactly for the purpose to save the energy conservation law! Despite all my respect for the philosophy of the Platonists, it seems to me that the attitude of the [Hermetic] alchemists, with their filius philosophorum as a symbol of transformed reality, is closer to modern feeling. The "transformed reality" is of course the above transmutation, and such a transmutation happens in the physical world. Thus, we see the difference between Neoplatonic and Hermetic alchemy: The former does not produce anything (physically) new, however the latter does, since it leads to a transmutation of matter. Of course Pauli describes here implicitely also the difference between the first phase of Gerardus Dorneus' opus, the unio mentalis, and the second, the unio corporalis I showed in Chapter 4 of The Holy Wedding (see http://paulijungunusmundus.eu/hknw/holy ... ntents.htm ). Though Pauli was conscious about the fact "that I carry ‘Kepler’ as well as ‘Fludd’ in myself," he did not succeed in reaching his goal "to arrive at a synthesis of this pair of opposites." The reason is that he was not yet able to see that Robert Fludd, Gerardus Dorneus, Michael Mayer and Paracelsus -- all Hermetic alchemists and physicians -- lived yet in a very different consciousness, in what I call today the Eros ego. As I wrote above, it is a consciousness which is based on the three functions feeling, (vegetative [Corr. of Aug, 6, 2010]) sensation and intuition, and like this a complement to the Logos ego. I define the Eros ego according to my experiences with my patients and with myself. Of course it was first a personal experience which led me to this theoretical hypothesis. And here my "personal equation" comes anew in. The Eros consciousness is what I lived in the cast in the "magic mountain" (Davos). The most important aspect of this period in my life is the fact that I learned to be in or remain in what I call today the introverted vegetative sensation [Corr. of Aug 6, 2010]. As I have shown in another place (see http://unus-mundus.fr/viewtopic ... ight=#1190 ) I define the sensation function in a different way compared with Jung. In his definition in Psychological Types he does not relate the sensation to what I call "the inner, the vegetative aspect of the body." The extraverted as well as the introverted sensation are always related to the extraverted perception with the help of the five senses. My discovery is that I saw and felt that there exists also an (introverted) vegetative sensation function [Corr. of Aug 6, 2010]. It talks in deeply vegetatively experienced inner images [which is not the case in Carl Jung's Active Imagination.] and this way is able to transform symptoms into vegetative symbols. It is the perception with the help of the Vegetative (sympathetic/parasympathetic) Nervous System (VNS), whereus Carl Jung's perception function, his definition of the sensation (the extraverted as well as the introverted) is based on the Central Nervous System (CNS). The introverted corporeal sensation is the basis of my imagination method, Body-Centered Imagination. Neither Carl Jung nor Wolfgang Pauli were able to realize the (introverted) vegetative sensation. Thus, neither of them was able to realize what I call the Eros consciousness. Last edited by Remo Roth on Fri Aug 06, 2010 8:46 am, edited 2 times in total. I'd like now to come back to Wolfgang Pauli's paper Background Physics. As we have seen the motivation to write it was the fact that he began to dream of physical terms, which were however not at all presented in the usual physical way. They seemed to have a different meaning. In the first chapter of his essay Pauli deals with two such physical-symbolic terms: The doublet structure of the spectral lines (which are correlated to the fine structure constant!) and the isotope separation. The physical background for the understanding of these two terms is a little difficult. [The reader who is interested in these ideas of Pauli finds them in Atom and Archetype, pp. 180 - 183.] Thus, I only quote Pauli's interpretation of hundreds of such dreams he gives in the paper. According to Pauli, the first message of the dreams is that it is of fundamental importance to separate the energetic processes into two different states with similar but different reactions. The second conclusion is that such a separation is not possible with the help of the mere observation with the eyes, but only with a different observation with the help of a conscious method. Then he asks if such a method could not be the alchemical imaginatio vera non phantastica. Let's begin with the second conclusion. It seems obvious that the preconscious knowledge of the unconscious would like to tell Pauli that it is not the perception with the help of the CNS (Jung's sensation function; see below), and thus not the physical experiment, which serves this special observation method. This method is in fact the alchemical imaginatio vera, however, as we will see, not interpreted as Active Imagination, but as what I call Body-Centered Imagination. "Physical energy is, without exception, indestructible; it does not change into hidden, nonphysical forms of energy (such as 'psychic energy', for example)." This statement is a direct conclusion on the background of the energy conservation law of physics. On it Neoplatonic science is based, which tells us that though we can transform energy from one state to another, we cannot increase or decrease its amount. As we remember, exactly this physical hypothesis is also behind Pauli's invention of the neutrino/antineutrino. It is true that physical and "psychic energy" cannot change into each other, as Pauli thought. This is why these two energies are complementary in the meaning of quantum physics. Symbolically seen, we can compare such a situation with the complementarity of the particle and the wave: physics is the "particle" aspect of the world, depth psychology is the "wave" aspect. What Pauli was not yet able to see is that the "fundamental importance to separate the energetic processes into two different states" means that there is another form of energy. In a neutral language I call it the matter-psyche. [For the definition see http://unus-mundus.fr/viewtopic ... tible#1613 , and http://unus-mundus.fr/viewtopic ... dinger#740 ] It is the energy of the unus mundus or of the psychophysical reality Pauli and Jung looked for. Thus, it is the matter-psyche, which corresponds to the other state of energy Pauli's dreams talked of. He was however only able to realize what I call outer spirit-psyche, ie physical energy, and inner spirit-psyche, ie Carl Jung's objective psychic energy. As we will see, background physics in my definition, which is in fact a theory of the unus mundus, deals with the transformations of spirit-psyche into matter-psyche et vice versa, a process Wolfgang Pauli as well as Carl Jung were not yet able to realize. It is what I call the twin process, the latter the fundamental energetic process of Hermetic alchemy and of the second phase of Dorneus' opus, the unio corporalis. Last edited by Remo Roth on Thu Jul 06, 2006 2:24 pm, edited 1 time in total. I mentioned above that Pauli changed from thinking to intuition as his main function, and like this solved his distortion problem. Like this he was able -- in fact already at the beginning of his analysis in 1931 -- to enter what Carl Jung called the symbolic thinking. Already in 1912, when Jung published the chapter Two Kinds of Thinking in Symbols of Transformation he anticipated such a transformation. He describes it there as the transformation of the directed thinking into the associative thinking, the (day) dreaming or fantasizing. Further he states that like this thinking in words ends and transforms into images and feelings (CW 5, § 17-20). It is this state which is important to reach for a successful association and interpretation process of one's own dreams. It is also the necessary state for doing Active Imagination. As we however realize, one function is not contained in this state: the sensation function. This is the case since sensation is the so-called inferior function of an intuitive type, and like this the most repressed. In fact, the sensation function is not necessary for this symbolic thinking or fantasizing, since the latter does not at all deal with the outer reality. I would say that this state is the first step in the individuation process. It is the first realization of what Pauli called "a different observation", the complement to the physical and scientific observation in general, the latter the observation of the outer world with the help of "the naked eye" (as Pauli writes p. 183). With the help of the symbolic thinking it is possible to deal with the objective psychic energy (Carl Jung), the complement to physical energy and the outer processes effected by it. In my terminology this process is a transformation of the identification of the ego with the outer spirit-psyche into an identification of the ego with the inner spirit-psyche. It is the state that Wolfgang Pauli reached. My experience -- my own as well as the one with my patients -- has shown that there exists however a deeper "inner observation method." I am convinced that Pauli's dreams and visions talked about this deeper observation method that he was however not yet able to realize it. As I wrote above (see http://unus-mundus.fr/viewtopic ... ight=#1885 ), Carl Jung's definition of the sensation function, of the extraverted as well as of the introverted, is based on the extraverted perception. The only difference between the extraverted and the introverted type is the fact that they digest these perceptions of the outer world differently: The introverted is much slower, and the perceptions activate much more inner images. I showed further that what Carl Jung calls sensation is the sensation percepted with the help of the Central Nervous System. What not too many people yet realize today is the fact that there exists also a perception with the help of the Vegetative Nervous System (sympathetic/parasympathetic ns). I call this perception the perception of the "inner aspect of the body and of the world in general." The function assigned to it I call the (deeply introverted) vegetative sensation [Corr. of Aug 6, 2010]. The vegetative sensation [Corr. of Aug 6, 2010] is part of what I call the Eros consciousness. While the "normal" consciousness of a scientist, the Logos consciousness, consists of extraverted thinking, (CNS) sensation and perhaps intuition, the Eros consciousness consists of introverted feeling, vegetative sensation (VNS) [Corr. of Aug 6, 2010], and introverted intuition. This deeply introverted consciousness is able to deal with a deeper aspect of what Pauli called "the other observation." It observes on the one hand the "inner aspect" of one's own body, on the other the "inner aspect" of the world. It observes the vegetative dimension of matter. Last edited by Remo Roth on Fri Aug 06, 2010 9:51 am, edited 2 times in total. With these two (or more exactly three) ways of experienceing we are back to Wolfgang Pauli's distinction between Neoplatonic and Hermetic alchemy. As I have shown in The Return of the World Soul, http://www.psychovision.ch/synw/platinf ... p1.htm#411 , he was the first who realized the difference between these two currents of alchemy. Neoplatonic alchemy is based on the idea that the psyche must be liberated from (mostly evil) matter and unified with the spirit in Heaven (after it had come down from Heaven; Neoplatonic alchemy deals however only with the ascent). Like this the "living part" is extracted from matter and the first coniunctio, the union of the psyche and the spirit takes place. However, matter dies! The dualistic concept energy/matter is extremely developed in physics and natural science. There any matter is inanimated, energy is however the moving and thus the living principle. Such a Neoplatonic concept is also behind Carl Jung's idea of the libido as the moving principle in depth psychology. As he describes in his work, he defines libido -- in an extension to Freud's view -- as the objective psychic energy. Since the physical as well as the depth psychological concept are both Neoplatonic, it was also possible for Wolfgang Pauli to show that quantum physics and depth psychology are complementary. The physicist looks at the outer aspect of energy, the depth psychologist at the inner. This is why I call physical energy in a neutral languge the outer spirit-psyche, objective psychic energy the inner spirit-psyche. It seems that for Neoplatonic science -- at least for physics and for the Jung before his heart attack in 1944 -- the energy conservation law is valid. No energy can be lost or created, it is just transformed. God is an unchanging principle in the eternity of the Heavens. In contrast to Neoplatonic alchemy, the central idea of Hermetic alchemy is the creation and incarnation of "new living matter" into the physical world. There the ideal is not the eternal circulation without any change as in Neoplatonic alchemy, but the transmutation. Hermetic alchemy contains therefore the idea of a so-called creatio continua, the possibility of a creation and incarnation at any time, in contrast to the creatio ex nihilo, the idea of God's big bang at the very beginning, and no (acausal) change after this creation act. The Neoplatonic idea of a creatio ex nihilo is the background of Newton's and Einstein's physics. In or shortly after the big bang the forces and mathematical laws of physics were created, which never change in eternity. On the other hand, the creatio continua is the archetypal background of quantum physics. Every acausal event is in fact a creation and incarnation act, since there is not cause that effected the effect. Something completely new has been incarnated into our material world, though not too many physicists are conscious of this fact. Last edited by Remo Roth on Sun Jul 09, 2006 8:34 am, edited 1 time in total. Because of the acausality of the process, the unique radioactive decay is not observable with the help of physical observational instruments. One would thus need a "different observational method" -- exactly the idea that chased Wolfgang Pauli after the invention of the neutrino/antineutrino in 1930. However, science was not able to find this different observational method since it is unconsciously based on Neoplatonism: The conscious spirit-psyche liberated from matter, ie the Logos ego, observes the liberation of the collective spirit-psyche (physical energy) from matter in the physical experiment (only energetic processes are physically observable). But how about Pauli's dreams and visions about the "different observation method," if explained on a deeper (the psychophysical) level? Could there exist such a third observational method besides the physical/extraverted and the depth psychological/introverted? In other words: Could it be possible to observe such unique "radioactive decays" or singular quantum leaps in an "altered state" of consciousness. Could it be that the stranger/magician of Pauli's dreams and visions talked of such a procedure? This would mean that there is a possibility of the observation of acausal incarnation acts according to the creatio continua principle into the world of the physical and psychic Here and Now. In contrast to Neoplatonic alchemy the observation of such an incarnation was the goal of Hermetic alchemy. The latter was however not yet conscious about the possibility of the radioactive decay, ie of singular acausal creation acts in matter. Only quantum physics has shown that such acausal events exist, was however because of its Neoplatonic prejudices not able to find the right observational method. As we have seen, Wolfgang Pauli as well as Carl Jung were not yet able to develop or at least describe the Eros consciousness, the combination of introverted feeling, introverted corporeal sensation and introverted intuition. It is however exactly this "altered consciousness," which is able to apply the "different observational method" Pauli's stranger/magician recommended. In the state of the Eros consciousness one is able to observe what I called above the vegetative aspect of the world. It is a perception via the Vegetative Nervous System. The necessary precondition for such an observation is however that the Logos consciousness and the Central Nervous System are abandoned. The method I developed for such a different view is the so-called Body-Centered Imagination. In it deeply corporeally experienced inner images are observed, and experience shows that they can have a healing effect. In the language of quantum physics we would say that we are able to observe singular acausal quantum leaps. It is thus exactly the observation, which is not possible with the means of physics and of natural science in general. People who are engaged in such observations are in my definition the Hermetic scientists of the 21st century. In Chapter 4 of The Holy Wedding (see http://www.psychovision.ch/hknw/holy_we ... ntents.htm ) I have formulated the contents of Hermetic alchemy in a modern language. One of the decisive aspects of the Holy Wedding or (second) coniunctio, Gerardus Dorneus' unio corporalis, is the fact that spirit and matter meet in the middle, in an intermediary realm. Wolfgang Pauli was fascinated by this intermediary level he found in the alchemy of Robert Fludd (see http://www.psychovision.ch/synw/platinf ... p3.htm#431 ). He was however not yet able to see that the conscious aspect of the intermediary level means that we have to abandon the "bright" Logos ego and enter the "dark" Eros ego. The latter "represses" thinking consciously, at least during the process I call Body-Centered Imagination. Like this it is, as described above, defined by the three functions introverted feeling, introverted corporeal sensation (Vegetative NS) and introverted intuition. Since Hermetic alchemists were identical with the Eros ego they were not able to see the difference between it and what I call the Logos ego, the scientific consciousness of today. Thus, the development of the Logos ego was a necessary phase of the collective individuation process. Only like this we can today see the difference between these two consciousnesses, and only like this we can now again return into the Eros. Historically seen, the conflict between Robert Fludd and Johannes Kepler was in fact exactly this discrepance between the two consciousnesses. Whereus Fludd stayed in the Eros, in Kepler the Logos ego began to develop (therefore his emphasis on mathematics and thinking). Today, the Eros consciousness is deeply repressed. Thus the Logos consciousness, the collective consciousness believes that it is the only boss in our world. However, as I have shown elswhere, the Eros consciousness comes now unconsciously back. One sees this in the UFO encounter and abduction phenomenology. During such an experience the ego is automatically and unconsciously thrown into the Eros consciousness, in which it has to observe the "vegetative aspect" of the world and the universe. This means that these "UFO victims" are forced to observe with the help of the Vegetative Nervous System. We can thus state that the "victims" of UFO encounter and abduction are unconsciously forced to use the observational instrument of Hermetic science. However, a better way would be to use this observational instrument in a conscious way. This happens in my Body-Centered Imagination. Last edited by Remo Roth on Thu Jul 06, 2006 3:00 pm, edited 1 time in total. We have seen that the first phase of Gerardus Dorneus's opus is the unio mentalis, in which the psyche is extracted from matter and unified with the spirit in Heaven. Further I have explained how this archetypal experience can be translated into a modern language: It is physics and natural science in general on the one hand, Carl Jung's depth psychology on the other. It is the "state of the art" of today. In the following I'd like now to show how the Holy Wedding, the coniunctio or the unio corporalis archetype, which corresponds to the second phase of Gerardus Dorneus opus, can be interpreted as the continuation of the above process, as the continuation of physics as well as of depth psychology in the 21st century. As I already mentioned above, the conscious aspect of this opus is the transformation of the Logos consciousness into the Eros consciousness. There is however also a deeper aspect of this process, even deeper than Carl Jung's transformation of "Self energy" into "conscious energy" (ie dream interpretation and Active Imagination), or how I call this process in a neutral language: The transformation of collective spirit-psyche into individual spirit-psyche, the process of becoming conscious, the individuation process of the mind. As we have seen, physics as well as depth psychology deal with the spirit-psyche, the former with the outer the latter with the inner. Thus it is in fact a process that deals only with what Taoists would call the yang aspect. In the unio corporalis however another aspect comes in, the yin aspect of the Tao. The following explanations are perhaps a little confusing since I am forced to use alchemical, Taoist and modern expressions together. This is the price I have to pay when I try to translate the Hermetic alchemical process into a language of today, in which we do not have the respective terms for the explanation of these processes. Thus excuse my symbolic language. In Taoism as well as in the Holy Wedding (unio corporalis) of Hermetic alchemy the central process is the so-called exchange of attributes: Yang becomes yin, and yin becomes yang. In Hermetic alchemy this process is demonstrated as the sexual union of the king and the queen (god and the goddess), in which the king enters however as a whole being the uterus of the queen. There he dies first. His sperm becomes then the seeds for new life. Since the king enters the uterus of the queen, we can also say that he becomes her phallus. Like this he becomes in some way feminine. Since the product of this procedure is always a boy, one can further state that the queen transforms into a masculine being. Thus the king becomes the queen, and the queen becomes the (new) king: The exchange of attributes. A very decisive detail of this process is the fact that the originally masculine sperm becomes in some way the sperm of the queen (or her phallus), and since the king dies, the new life is entirely procreated out of the phallus in the womb of the queen. In my interpretation of this process the "originally masculine sperm" coincides with the causal worldview, with Newton's and Einstein's world, with the creatio ex nihilo (which is the background of the completely causal big bang of today). The "feminine sperm" however, the sperm in the phallus of the queen, corresponds exactly to what quantum physics calls the (singular) acausal quantum leap. It is the creatio continua, an acausal creation and incarnation process physics discovered in 1895 with the natural radioactive decay. My hypothesis is now that such acausal singular quantum leaps are observable with the help of the Eros consciousness. Like this one can also say that the Eros ego is the "different observational instrument" of Pauli's stranger/magician described in his "Background physics" (see http://unus-mundus.fr/viewtopic ... ight=#1888 ), a consciousness which is able to observe the creation and incarnation acts that happen during the Holy Wedding, during the unio corporalis. The yin aspect, the queen or the goddess, has no worth and no right of existence in science. However the Taoist as well as the Hermetic alchemical template show that this feminine aspect is very important. In a neutral language I call it the matter-psyche. Thus, we have two different sorts of energies, matter-psyche and spirit-psyche, whereus the latter is split into an outer and an inner energy, into physical energy and objective psychic energy. Last edited by Remo Roth on Thu Jul 06, 2006 3:11 pm, edited 1 time in total. That the energy term must be bipolar, and thus contain the spirit-psyche as well as the matter-psyche, one can show with the help of a modern interpretation of the so-called alchemical Axiom of Maria Prophetissa. I cannot go in details here, but if you google with < remo roth axiom maria prophetissa >, you find explanations of my interpretation. Let us now shortly return to the two main contents of Pauli’s dreams and visions after his invention of the neutrino/antineutrino in 1930 (see http://unus-mundus.fr/viewtopic ... ight=#1888 ). We remember that the stranger/magician wished first a "different observational method" and second a "separation of energetic processes into two different states." It is the Eros consciousness which corresponds to this "different observational instrument", and with the help of it one is able to observe the two different states of energy, the spirit-psyche and the matter-psyche. Further the Eros ego is able, as I will demonstrate in the next post, to observe the acausal transformation of spirit-psyche into matter-psyche et vice versa, which is in fact the exchange of attributes, the decisive process of the Holy Wedding or unio corporalis. This procedure is the main procedure of the Hermetic science of the beginning 21st century. As we have seen, physics as well as depth psychology deal with the spirit-psyche, the former with the outer the latter with the inner. Thus it is in fact a process that deals only with what Taoists would call the yang aspect [of the Tao]. In the unio corporalis however another aspect comes in, the yin aspect of the Tao. The statement that Carl Jung's depth psychology deals only with the spirit-psyche is perhaps new to the reader, since Carl Jung states that the ego needs the Anima for the relationship with the Self. Thus the feminine aspect seems to be included. The trouble is however that Carl Jung's Anima is not the yin aspect of the universe. If we look a little closer, we see that what he calls the Anima is in my neutral terminology the feminine spirit-psyche. Thus, it is feminine, but yang. We know today that he developed his concept of the Anima with the help of three woman, Maria Moltzer, Sabina Spielrein and Toni Wolff, who were however all the same type as he was: thinking/intuition or intuition/thinking. Thus they represent the feminine spirit-psyche, however not the matter-psyche. Further, in his quaternarian Self, the Anima is only one-dimensional. One sees this very well in his book Answer to Job where he compares his quaternarian Self with the Trinity plus the Holy Mary in the Heavens. Thus, it is a (3+1) quaternity, and the feminine is not tripartite. On the other hand Carl Jung tells us in his Trinity article that the unity is not observable. It must be differentiated into a threefold structure ("Trinity"), only like this it becomes observable. Thus, IMO, instead of the quaternity, the (3+1) structure, there should be a structure characterized by (3+3) -- the Seal of Solomon. In it the feminine aspect is equivalent to the masculine. In http://www.psychovision.ch/hknw/holy_we ... _e.htm#451 and http://www.psychovision.ch/synw/sealofs ... 52.htm#521 (section 5.2.1.6) I have shown the difference between the Anima and the anima mundi. I have also shown that Carl Jung by calling both of them "psyche" mixed them up. In developing a theory of the unus mundus it was therefore a necessary step to me to differenciate the “psyche” (Jung’s Anima) from the “Psyche,” (the anima mundi). The former I call the female spirit-psyche, the latter the matter-psyche. By not differentiating these two completely different terms -- they are observed and experienced completely different -- Carl Jung was not able to differentiate between Active Imagination and what I call today Body-Centered Imagination. In his work we find therefore contradictory definitions of A.I. On the one hand he stresses that A.I. is verbal, for example when he tells us in MDR that it was developed out of his experience with Philemon/Elijah (they talked together). On the other hand he shows us, especially in explaining A.I. with examples of his feminine patients, that one can do it also with the help of the sensation function (in his definition; see http://unus-mundus.fr/viewtopic ... ight=#1190 , http://unus-mundus.fr/viewtopic ... ight=#1885 and http://unus-mundus.fr/viewtopic ... +jung#1897 ), for example by dancing, sculpturing, painting, etc. The trouble is that the term “synchronicity” is defined without any exchange of energy – it is not the "energy" of the dream which effects the outer event – and like this the two events cannot be causally connected, but only acausally (there is not cause which leads to an effect). On the other hand however “vitalizing” is a causal, deterministic term, which means that a force or an energy effects matter and like this vitalizes it somehow. Thus, we have a discrepancy, which we have to abolish. IMO this is only possible if we accept that besides the inner and outer spirit-psyche (objective psychic and physical energy) there exists the matter-psyche, the magic or parapsychological energy (which belongs to the “singular quantum leap” of the twin process of the unio corporalis (Hermetic alchemy). Remo, I fully agree with you. Of course the most difficult bit to swallow for the thinking function is the acausal aspect of the process. However the experimental material confirms again and again the matter-psyche aspect and the 'magic belonging to the singular quantum leap of the twin process'. This is the marvel of all this. Matter-psyche as the energy of the unus mundus flows into the einsteinian world and acausaly creates. Be it in the UFO/crop circles phenomenology or the healing one. But then, and this is of the utmost importance, the way human consciousness behaves has a great incidence on the process. If it says on the Logos power side (thus ignoring/negating) the flow of incarnations has a negative aspect, if it enters the wu wei stance (acceptation from the Logos Ego to 'switch off' and 'liberate' the acausality) then un-willed positive incarnations take place. The ultimate power of the will is to switch itself off for a while. Further, however, I believe that a permanent state of coniunctio is reachable, where Logos Ego and Eros Ego stay together at the junction (the centre of the seal) one slightly 'taking over' the other when necessary, this necessity being felt in the perception of the Kairos. This is I gess the meaning of the rotatio, the permanent exchange of attributes. I am afraid though that very few people can be in such a stance at the moment. Yes. I just described this state in another post; see http://unus-mundus.fr/viewtopic ... ight=#2110 . I guess that this is my really new discovery. In these processes the negentropy of physical and/or objective psychic energy is increased, since such acausal processes are real incarnation acts. In the crop circles we realize such an increased negentropy -- means: higher order -- in the fact that the disorder of the crop is ordered in mandalas. With the help of their number symbolism we can perhaps find out what they are talking about. There is even one crop circle, which had a verbal message. I'll try to find it. Before I can go on, I'd like to add a third remark. Since the Pauli/Jung letters Wolfgang Pauli und C.G. Jung, Ein Briefwechsel 1932 - 1958, edited by C.A. Meier and published in 1992 contain very many, and some very severe mistakes (which are now also in Atom and Archetype), I read the originals of the letters inclusive the "Background Physics" essay in the library of the ETH, Zurich. The manuscript Hs 1055: 1024(3) (typewritten by Aniela Jaffé; one of the three copies of this ms.) contains handwritten comments of Carl Jung. This allows us to realize how Carl Jung understood Pauli's ideas (at least in 1948, when the ms. was written and sent to Jung). I have quoted above (see http://unus-mundus.fr/viewtopic ... ight=#1888 ) Pauli's insight that we need "a more delicate form of observation ... a methodically guided imagination (imaginatio vera non phantastica)" [AaA, p. 183] for the observation of the "other reality" described in his dreams with the help of "physical-symbolically enhanced terms" (as for example "radioactivity"). At the margin of the term "a methodically guided imagination", with which Pauli ment of course the imaginatio vera of the old alchemists, Jung wrote "amplification and interpretation." This is very astonishing. One would think that he compares the imaginatio vera with his Active Imagination. On the contrary he compares it with his amplification method, which helps the interpretation of archetypal dreams and visions. Thus, we see that the imaginatio vera transforms in Jung's understanding into the amplification. The latter is however a means of the intuitive thinking to amplify the content of the dream, and like this to find an interpretation on the collective level. It is the Neoplatonic way of doing science. The conscious spirit-psyche (the Logos ego) deals with the unconscious spirit-psyche (the preconscious knowledge of the unconscious) somewhere hidden in the instincts, in the body or in matter, liberates like this the psyche imprisoned in matter and transforms the unconscious psyche into conscious spirit-psyche. The imaginatio vera of the alchemists was however surely not such a method. Since they lived yet in what I call the Eros consciousness, they sensated and felt deelpy corporeally experienced inner images, and not amplifying thoughts. Here again Carl Jung's "cure" of his "faintness neurosis" comes in. He did this "cure" with the help of forcing himself into thinking, learning, doing science (see http://unus-mundus.fr/viewtopic ... rosis#2004 ). It is true that like this he discovered the collective unconscious (what I call the collective inner spirit-psyche), was however not able to quit the brain and enter the Eros ego. The imaginatio vera of the old alchemists was however exactly the perception of contents of the Eros Self (or of the unus mundus with the help of the Eros ego. The same limitation happend to Pauli because of his defense of the energy conservation law. Thus both were not able to enter a conscious empirical experience of the twin process, and on the background of this experience to find a theoretical description of the processes of the unio corporalis of Hermetic alchemy. This fact is insofar important, as like this also Pauli's "Background Physics" is not an explanation of the Hermetic alchemical process. Without the help of the specific Hermetic alchemical process one cannot describe the psychophysical reality, the unus mundus. Therefore Pauli's "Background Physics" is not yet the theoretical explanation of the structure and the processes of these "otherworldly" realms.